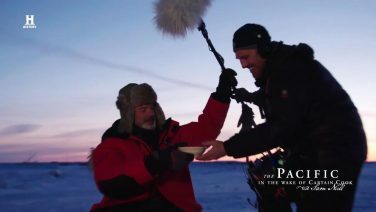 In The Pacific, Sam Neill crosses the length and breadth of the largest ocean in the world to experience for himself a contemporary journey in Captain Cook’s footsteps. Captain James Cook’s incredible epic voyages of discovery are as controversial now after 250 years as ever. The life and work of a shop boy was not suited to this erudite young man and some historians have fondly speculated that this is where James first felt the lure of the sea whilst gazing out of the shop window and dreaming of the deep blue. Read more.. The HMS Endeavour departed England on the 26th August 1768. Lieutenant Cook and his crew rounded Cape Horn and continued westward across the Pacific to arrive at Tahiti on the 13th of April 1769, where the observations of the Venus Transit were made. In what almost seems a footnote to history in this age of satellite-based navigation systems, the result of the observations were not as conclusive or accurate, as Lieutenant Cook and the voyage’s official astronomer, Charles Green, had hoped. Read more.. 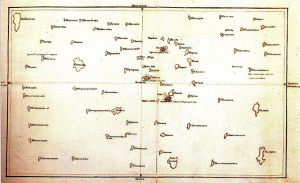 Image: Tupaia’s chart of the islands surrounding Tahiti in Oceania, c. 1769, courtesy of Wikimedia Commons. In 1772, Lieutenant Cook was promoted to Commander. This promotion led to a new expedition to settle once and for all the speculative existence of the Great Southern Continent by ‘prosecuting your discoveries as near to the South Pole as possible’. Two sloops, Resolution and Adventure, under the commands of Commander Cook and Lieutenant Tobias Furneaux respectively, left Sheerness in June 1772 and sailed to Cape Town. The ships became separated in the southern Indian Ocean and the Adventure sailed along the southern and eastern coasts of Van Diemen’s Land before reuniting with the Resolution at Queen Charlotte Sound in New Zealand. The ships explored the Society and Friendly Islands before they again became separated in October 1773. 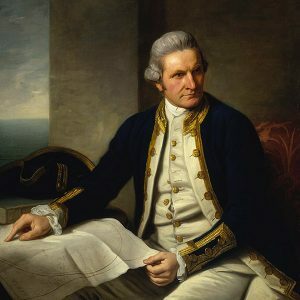 Read more..
By 1776, James Cook was well-renowned for his seamanship, surveying and exploring. He had commanded two great voyages around the world and become the first European to visit many parts of the Pacific. Once again promoted by Admiralty, he set out on his third and final voyage of exploration with two ships, the Resolution and Discovery. The voyage’s principal goal was to locate a Northwest Passage around the American continent. After a short stay in Tahiti, the Resolution and Discovery travelled north. Read more.. 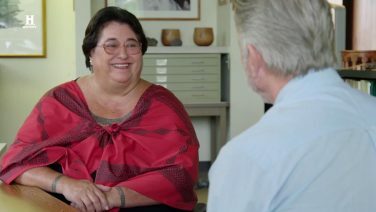 Resolution and Discovery returned to Hawaii in 1779. After sailing around the archipelago for about eight weeks, they made landfall at Kealakekua Bay, on the largest island in the group. 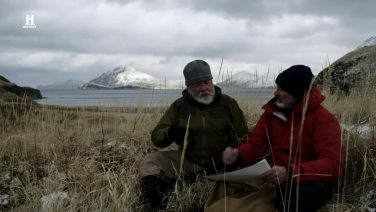 After a month’s stay, they attempted to resume their exploration of the Northern Pacific. Shortly after leaving Hawaii Island, however, the Resolution’s foremast broke, so the ships returned to Kealakekua Bay for repairs. Tensions rose, and several quarrels broke out between the Europeans and Hawaiians at Kealakekua. An unknown group of Hawaiians took one of the Europeans’ small boats. Read more.. 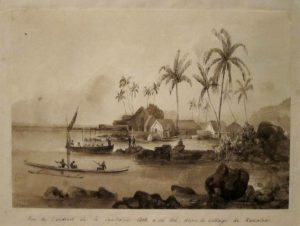 Image: View of the Place where Captain Cook Was Killed (Kealakekua Bay), pen, ink and sepia wash on paper by Stanislaus Darondeau, 1836, Honolulu Museum of Art, courtesy of Wikimedia Commons.